In mid-June I wrote about an arrival record for the Brig Callao in Norfolk and Portsmouth, with John O'Brien listed as a seaman in March 1826. 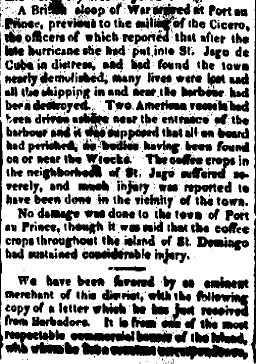 While I was in Europe at the end of June, a researcher at the Phillips Library in Searsport, Maine sent me copies of several newspaper articles from 1831 mentioning a hurricane that hit Aux Cayes, Haiti, sinking the Brig Callao. I do not know if John O'Brien was still part of the crew for the Callao at this time, but I do know that he ended his sailing career in 1831 and returned to America. 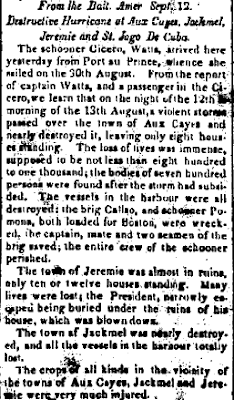 Apparently the hurricane that sunk the Callao was one of the strongest storms to hit Barbados. The storm struck Barbados on 10 August 1831 as a Category 4 hurricane, killing 1,500 people. The storm moved on to Puerto Rico, Haiti and Cuba before turning north into the Gulf. It struck Louisiana on 17 August 1831, flooding parts of New Orleans. 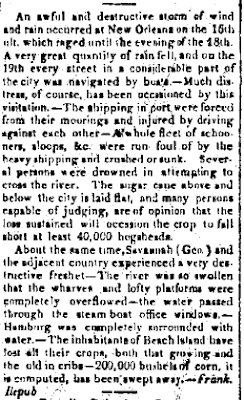 The first article comes from the Hagerstown (MD) Torch Light and Public Advertiser from 15 September 1831. 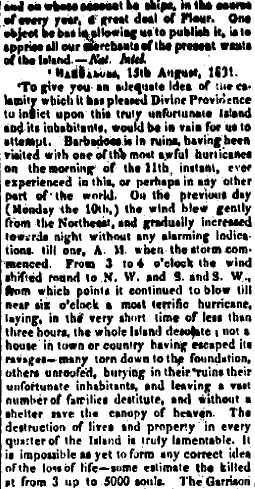 The second set of articles appeared in the Sandusky (Ohio) Clarion on 5 October 1831. This article notes that the Captain, mate and two seamen of the Callao were saved at Aux Cayes. If John O'Brien was one of the two seamen on the Callao, the storm pushed him into retirement from sailing and into land ownership in Illinois. 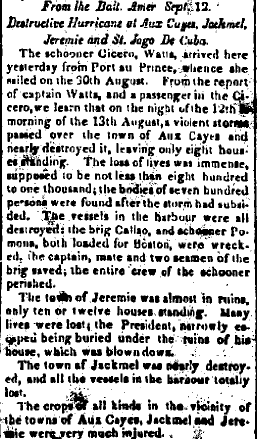 His obituary states in 1831 he was "tired of the sea". I am looking for more records that may shed light on John O'Brien's sailing days in the early 1800s. These newspaper articles show the impact of the storm and the delay in the spread of news.